Hello, I'm one month post op with a patellar graft. 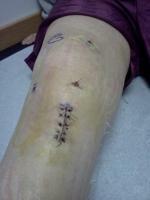 I injured my right knee on december 10th tearing my acl mcl and meniscus. It happened while i was playing basketball, i was runnign in for a lay up while my foot was slightly turned and i heard a "krrrrr" sound and fell to the ground with pain for about 5 minutes. I started icing it 10 minutes after, i was able to bend it but there were loud pop sounds that continued through my physical therapy sessions(there gone now after surgery) I had to wait 3 weeks to do anything while my mcl healed, then i had 2 weeks of pre surgery physical therapy. I had my surgery on January 26th, today is exactly one month since the surgery. My recovery process is going very well. Im completely walking without any support now. I depended on my crutches only for the first few days since my leg was completely numb. Once the shot i was given started wearing off i started putting some weight on it but still using the crutches. I got off the crutches after about 4 or 5 days. First few days after surgery are hard. I couldn't lift my leg at all I needed someone to help me get in and out of bed pretty much do everything. The nerve block shot helped alot cuz i didn't feel anything for about two and a half days. I took my pain medication for two or three days and i was off the hydrocodone before my 3 day post op appointment with the doctor. I used my brace for about 3 1/2 weeks post op. I started walking around the house without it for about four days but wearing it when i went out and past two days i stopped using it. I started physical therapy the following week after my surgery. 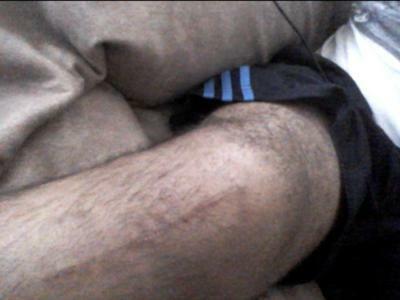 It was very frustrating since my thigh's looked and felt like jello i had lost almost all of the muscle. It's been 3 weeks of PT and finally it's starting to gain back some muscle. Today's measurement of my flexion was 133 of my operated knee and 136 on my other knee. So it took three weeks to get the motion back. I still have large area's that are numb, does anyone else have large numb areas??? I will update everyone on how I am doing every couple weeks. I'll feel free to answer any questions anyone has.